How do you organize your kitchen? Follow this complete guide, full of kitchen organization ideas and hacks, and you’ll have an organized kitchen in no time. The kitchen is the heart of the home. 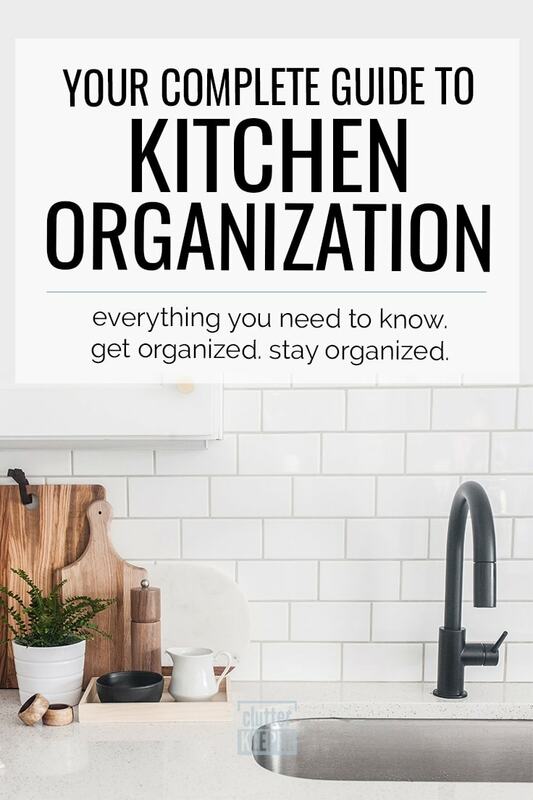 So here is a complete guide to kitchen organization with everything you need to know to get organized and stay organized. Start here to create an envious kitchen. Organizing your kitchen is very simple if you break it into zones. This guide will walk you through the main areas of your kitchen, one-by-one. By the end of the guide you will have an organized and spotless kitchen. The very first step is to organize your kitchen drawers. You want to start with the smallest places first. When you start small, you free up places to store all the rest of the things you will be cleaning out. It also gives you confidence. When you see each drawer cleaned and organized, you will feel amazing and become motivated to keep organizing the rest of the kitchen. Every single step you do in the kitchen will require 2 things: throw/give away things you don’t use or find a way to keep it. Make sure every single drawer has only one use. Junk drawers are difficult to organize and can become overrun with stuff that eventually becomes lost or broken. 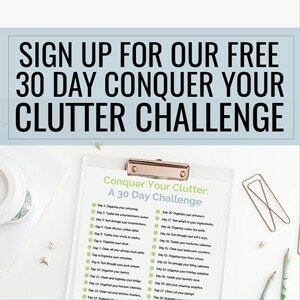 The good news is that with a little work, your junk drawer can be easily eliminated. Organize your kitchen drawers by buying drawer organizers. Here are some of the best products. Drawer divider – These are essential if you want to organize your kitchen drawers in your own way. A drawer divider can separate spices, large spoons, and even dishcloths and towels. Small containers – Small plastic containers are excellent for organizing items that might roll around in a drawer too much. These are great for organizing small random things in the kitchen like batteries and rubber bands. Kitchen Utensil Organizer – you can purchase ones that are removable and easy to clean or even find some that are adjustable for any drawer size. After you organize the drawers, it’s time to move on to the next biggest spot – the kitchen cabinets. Don’t get overwhelmed. Take it one cabinet at a time. Just like with the drawers, clean as you go and try to give away or throw away anything you can. Make your job easier by investing in some kitchen cabinet organizing products. These will separate your dishes and help you find what you need faster. Spice Rack – Free up space in your cabinets by hanging up your spices on the wall. There are some beautiful options. Plates Organizer – There are lots of organizers to solve your exact needs. The three-tier organizer is smart because you can stack different sizes of plates without having to lift up the small plates to pull out the bigger dinner plates. Cutting Boards & Flat Cooking Sheets – Free up more space by hanging these on the back of your cabinet door. Another very frustrating thing to organize are pots and pans. There are so many sizes and they all kind of just junk up the dark cabinets. One of the best ways to organize your pots and pans is to create deep pull-out drawers with drawer organizers. This is also the priciest option. 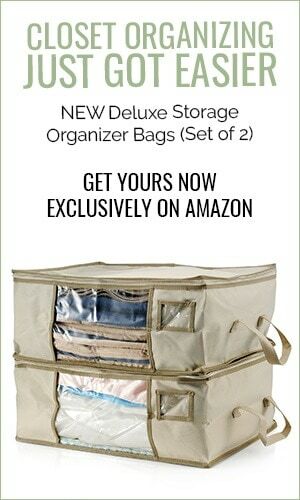 You can also take the advice from Organizing Homelife and with just a few products separate all your stuff. Her tutorial stacks the pans sideways, so she is able to store more but make it look so much cleaner. When you are finished organizing your cabinets, step back and take inventory. Does everything fit with room to spare? Avoid storing too much in your cabinets. Overstuffing the cabinets will only lead to disarray and more disorganization. Now it’s time to move onto the next zone – the kitchen counters. This includes the island, table, and any other horizontal surface in your kitchen. First, remove and put away everything that you see. Make it completely free of any loose items. Then decide – why did they end up here? Create a solution to prevent this from happening again. Maybe you need a place to store bills until they are paid. Or maybe you need a box for school papers. Whatever is out needs a home. Then, wipe down everything. Get it all nice and cleaned. That means moving the kitchen appliances like the microwave and blender. Wash the outsides of those too. At this point, make some tough decisions. How often do you use everything that is sitting out? If you haven’t used the food processor more than once in the past 3 months, consider storing it in your pantry. Consider rearranging your countertops. Does everything make sense the way it is, or could you create a more efficient workflow if you moved things around? Place a vase of flowers on the counter. Set out a basket of colorful fruit. Decorate your kitchen – but be careful to keep this minimal. Avoid creating more clutter with your decor. Even if your pantry isn’t directly in your kitchen, it is a part of your kitchen because it holds all your food. Organizing it is the next logical step. Clutter Keeper has a guide for organizing your pantry in just a few steps. Follow this guide and you’ll have the pantry of your dreams! Everything is looking pretty amazing at this point! Now it is time to clean out and organize the dreaded space under the kitchen sink. Yes…things get thrown under here for a reason. It’s dark. There is plumbing. And things are forgotten about because it’s not a fun area of the kitchen. So the first thing you need to do is clean it out. Take everything out and rinse it all off. Throw away anything you aren’t using that you might have forgotten about. A pull-out drawer will make it so much easier to reach everything under your sink so you don’t have forgotten items in the back anymore. If you are pretty handy, you can make your own. It might take a little bit of time, but it is worth it. Now if you aren’t all that handy, or just don’t enjoy making things, you can buy pull-out wire baskets. There are many in a variety of sizes, so measure your cabinet first before you buy one. What is stored under your sink? Try to keep things organized by using wire or plastic baskets. You want to keep the storage solution water proof just in case there is ever a leak. So store your cleaning supplies in one basket and your food storage things in another. The next area to organize in your kitchen is your refrigerator and freezer. Remember, the end goal is a completely organized and clean kitchen, so where you store your perishable food counts. There are some epically organized refrigerators on blogs and social media. If you have time to maintain something like that, go for it! Keeping your fridge spotless will boost your mood and save you time when you go to prepare a meal. But if reality hits and life gets way too busy, don’t worry too much about perfection. Just make a goal of having a clean refrigerator (so you and your family stays healthy), and one where you can find what you need, quickly. Before you can organize it, you need to clean it out. Do this in sections, washing down all the shelves, drawers, and doors. Throw away expired foods or food that you haven’t eaten in months. Only keep what you will eat. While you are wiping the shelves, wipe off the food containers too. Don’t put anything back in the fridge that will make it dirty or sticky again. Now that everything is clean, it is time to start organizing where it is stored. Try to store similar things in the same area. This is where online inspiration comes in really handy. You will be more likely the throw away the empty bottle of ketchup if it isn’t sitting hidden in the very back of your fridge. Putting a lazy susan in your refrigerator is the best refrigerator organization idea ever. Just look at how helpful it is. Condiments and leftovers are some of the most common forgotten things, so making them more accessible is a tip you’ll be glad you discovered. Try to remember to remove food and food containers from your refrigerator. Either throw away old food or use it to in your garden’s compost pile. But no matter what you choose, it needs to be out of your fridge. The same goes for food containers. Keeping empty condiment bottles makes the refrigerator more difficult to use, so throw them away or recycle them. Congratulations! You should now have an organized and clean kitchen! This post won’t be complete without a few hacks that will make your life easier. There are tons of kitchen organization hacks online. Some are pure genius and others are kinda silly. But this list has the best hacks that honestly do save you space and make a kitchen more organized and functional. This is a hack that was created for people living in an RV. RV travelers know how to store everything they need in a very small space. So if you have a small kitchen, this hack is perfect! You can find a plastic magazine holder at most stores. Use this as a storage solution for paper goods like paper plates and napkins. It keeps everything upright and prevents them from falling over and creating a chaotic mess. Have a small kitchen? Check out out Top 10 Space Saving Hacks for your Tiny Kitchen. The next hack is amazing for anyone that struggles with a location for pots and pans. All you need is a towel bar and some hooks. Hanging up the pots and pans gives you more storage space in your cabinets and makes them easier to grab and use. “How do you store your spices in your kitchen?” It’s such a huge headache when you are trying to cook and you can’t find the exact spice you need, so you pull everything out. There are a ton of fantastic spice rack ideas online. But one of the most creative is to fill old baby food jars with your most commonly used spices and attach them to the refrigerator as magnets. This puts all your favorite spices in hand’s reach. It also saves you time when it comes to grocery shopping – you can literally see which spices you need without opening a cabinet door. One of the worst uses of space is the false drawer fronts under the sink. Consider hacking this space as a place to store sponges and small scrub brushes. This keeps your sink area cleaner, with little effort. How do you store measuring cups and spoons so you can find them? Attach a cork board to a cabinet door and hang them up. You can also attach a measurement conversion chart next to them so you never have to look it up. If you have a really small kitchen, it might seem impossible to keep everything organized. Sure, it’s easy to have an organized room when you have tons of places to keep your stuff. But even a tiny kitchen can be a place of tidiness. It just takes discipline and creativity. Follow one – or all – of these tips to keep your small kitchen organized. The first tip is to use an over the sink cutting board to add more countertop space. This can help you during food prep – especially if your counters are filled with the other ingredients and cooking supplies. You can also use a clean cutting board to sit food on when company visits, or even use it during the day to give the appearance of more space. The second tip for a small kitchen is to simply keep less stuff. If you browse small kitchens online, a common theme is countertops clear of items. Find places to store all your appliances and dishes. Don’t let dirty dishes pile up in the sink. Turn your walls into more storage places. Hang up pots and pans, a spice rack, even floating shelves for cups and plates. If you have an empty wall, then you have an opportunity for more storage. The final tip is to decorate with light colors and bold accents. Think whites with bright yellow accents. Or light yellow with a bold red accent. Light colors open up small spaces, dark colors make spaces feel smaller. Now that you have a beautifully clean and organized kitchen, celebrate! Invite friends and family over. Cook a meal for your family or significant other. The challenge will be keeping it this clean. 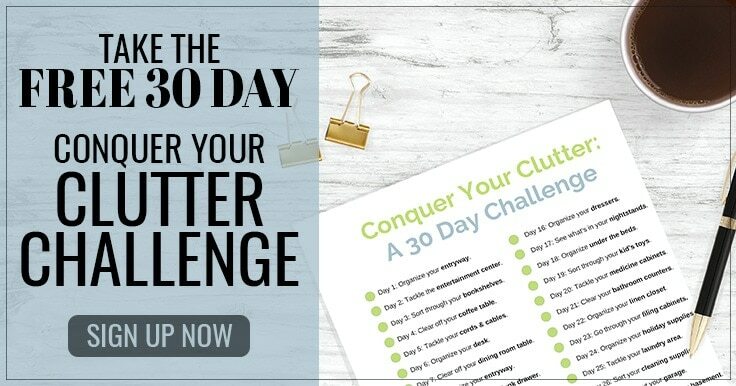 So set up a cleaning schedule that you can stick to. Put reminders in your calendar and try to stay on top of your kitchen. Once a week go through your fridge, pantry, and cabinets and just lightly sort everything. Rearrange the food and any items in your cabinets and make sure everything looks its best. Make sure the countertops are clear of unused items and put everything where it belongs. Once a month clean out your microwave and wipe down the tops and outside of the appliances. This is the time you make sure everything shines. Before each new season, assess your kitchen. Get rid of anything you don’t use or haven’t used enough. If an organization decision isn’t working, try something new. There you have it! Everything you need to know about kitchen organization. Keep this guide handy – pin it, save it, bookmark it. An organized and efficient kitchen is possible, it just takes a little time and dedication. Here are some more fantastic kitchen tips, answering all your kitchen organization questions. Pantry Organization – Organize your pantry in 6 simple steps. 13 Family Command Center Ideas – You’ll find something that works for you in this fantastic list.